The Nutcracker and the Four Realms is like an over-rich Christmas cake. It has plenty of ingredients in the mix: some are very tasty, some you would put aside and some make you wonder why they are there in the first place. Source: ACOFB. The film was codirected by Swedish director Lasse Halstrom, who has been directing a wide range of films for the last 40 years, especially in the United States. He is joined by action director Joe Johnston. One might wonder which sections were directed by which director. While the opening has the look of London, the family has very Germanic names, and, once the audience is taken into the Four Realms, the main castle looks like the Cathedral of St Basil in Moscow. Matthew McFadyen is Mr Stahlbaum, a stern father, mourning his wife and trying to make emotional contact with his grieving daughter, Clara (Mackenzie Foy). He demands she attends a party celebration with her brother and sister and dance with him. Instead, Clara goes to the basement, finding a friendly inventor (Morgan Freeman looking and sounding American – bizarre in this context). She opens a decorated egg that was a gift from her dead mother. It has the key to her future and it will guide her to look into herself and find her strengths. 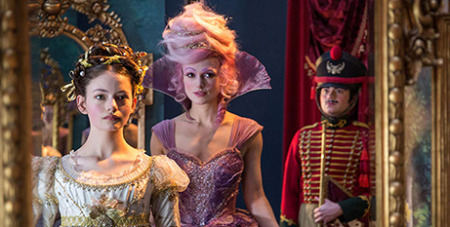 She is led into the Four Realms, where she meets a sympathetic Captain, falls down a hall that is reminiscent of Alice in Wonderland, encounters strange characters and befriends Sugar Plum (Keira Knightley), who appears to be all eccentric sweetness and light. There are some revelations about who Clara actually is, the identity of Clara’s mother and searing power struggles and Sugar Plum revealing sinister ambitions, bringing toy soldiers to life with mischievous mice, battles and some derring-do. All’s well that and ends well but it has been something of a gluggy journey to get there. Reviewed by Fr Peter Malone MSC, ACOFB.